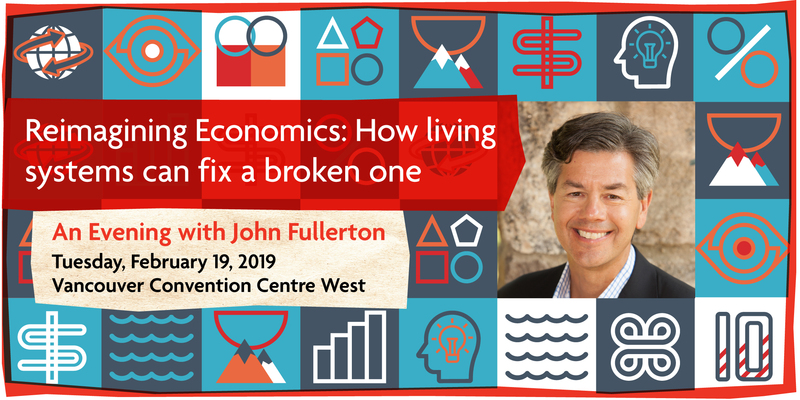 Join us for an evening with John Fullerton as he lays out a path to a healthier economic system. For Vancity members, enter promo code 'Vancity5' to receive your $5 admission discount. John is an unconventional economist, impact investor, writer, and, some have said, philosopher. Building on and integrating the work of many, he is the architect of Regenerative Economics, first conceived in his work Regenerative Capitalism: How Universal Principles and Patterns Will Shape our New Economy. This conversation will be hosted by CBC award-winning journalist, Laura Lynch. Vancity is proud to present this public event as part of the first-ever Global Alliance for Banking on Values Summit, a gathering of banking leaders from around the world committed to advancing positive change in the banking sector so that it supports social, environmental and economic sustainability. Click here to learn more about Vancity's commitment to values-based banking. Through interactive displays, event guests will have an opportunity to engage with local organizations and learn about the ways these businesses are actively transforming their communities. All event guests will receive a $5 token to redeem a small gift from some of the marketplace vendors.